Prize: win instant prizes like Movies for a Year* or a Pair of Movie Tickets†! 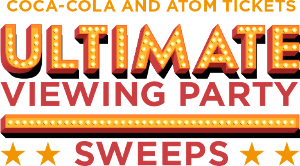 You’ll also be entered for the Grand Prize: an Ultimate Viewing Party with free movie tickets and Coca-Cola beverages for you plus 50 friends! What you must do to enter: register - You will receive 1 Sweepstakes entry and will advance to the Instant Win Game page where you will receive 1 Instant Win Game play.